Please eat soon after opening. Ingredients: Corn, Palm Oil, Canola Oil, Sugar, Margarine (Refined Palm Oil, Water, Salt, Flavour, Emulsifiers (E471, E322), Acid (E330), Colour (B-Carotene), Antioxidants (E320, E321)), Salt, Colour (E150a), Flavour & Flavouring. 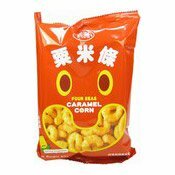 Simply enter your details below and we will send you an e-mail when “Caramel Corn (四洲粟米條)” is back in stock!